How's that quote go? Those who can't remember the past are doomed to repeat it? Above, you can see that the president retweeted a picture of the late Pat Tillman,who was killed by friendly fire while serving in Afghanistan in 2004; the comment from the original user, who calls himself a Trump supporter 110%, suggests that it's dishonoring Tillman, himself a former NFL player, to kneel during the national anthem. 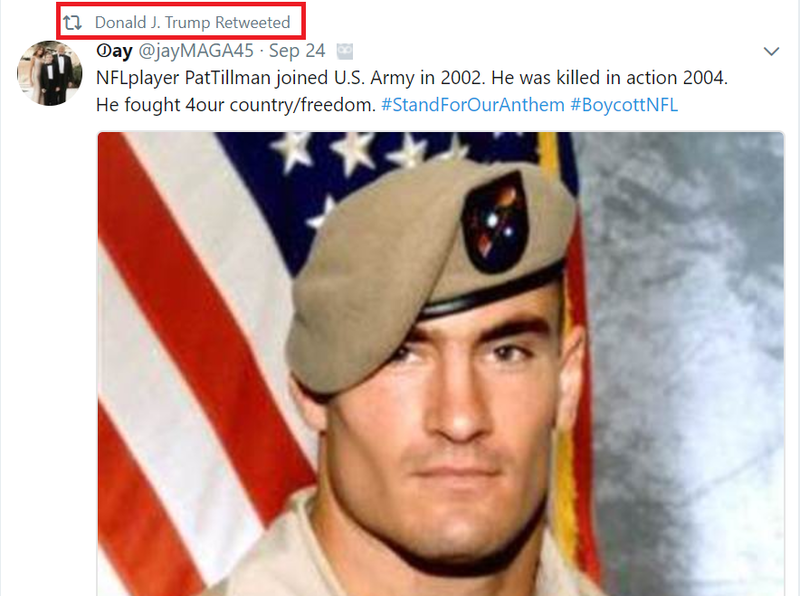 Do you think anyone thought to check with Tillman's widow, to see what she thinks about her husband's name and likeness being used in this manner? Uh, that would apparently be a no. As a football player and soldier, Pat inspired countless Americans to unify. It is my hope that his memory should always remind people that we must come together. Pat's service, along with that of every man and woman's service, should never be politicized in a way that divides us. We are too great of a country for that. Those that serve fight for the American ideals of freedom, justice and democracy. They and their families know the cost of that fight. I know the very personal costs in a way I feel acutely every day. The very action of self expression and the freedom to speak from one's heart - no matter those views - is what Pat and so many other Americans have given their lives for. Even if they didn't always agree with those views. It is my sincere hope that our leaders both understand and learn from the lessons of Pat's life and death, and also those of so many other brave Americans. And yes, this is not the first time or even the second time this has happened. Much as Trump co-opted music that he liked or thought made a statement throughout his campaign, without permission of the artists, he and his allies have also done this type of thing with others whose lives were lost. US Ambassador Chris Stevens, who was killed in Benghazi, has been a frequent pawn in the Republican playbook. His mother was forced to issue a terse statement asking them to cease and desist the "opportunistic and cynical use" of his name. The family of Kate Steinle had the same problem, when "Kate's Law" starting making the rounds after she was killed by an illegal immigrant. Her family didn't want her name to be "in the center of a political controversy" and, as is the case with Tillman and Stevens, the family does not hold the same beliefs as those taking her name in vain. Those who do not learn from the past are doomed to repeat it. And repeat it. And repeat it, it seems. But I guess you can do that when you think you have exclusive rights to defining patriotism and what it means to be an American, and when you think that you have the right to enforce that opinion on American citizens, companies and organizations. I looked for, and did not see, a note from the patriot in chief to his 39 million real and fake Twitter followers that he apologizes for yet again using someone's name for his own political gain. I'll keep an eye out, and will let you know if I see it.